In the June issue, we were talking about what to do when you enter a corner too hot and we touched upon trail braking as one way to avoid disaster. A number of you wrote in asking for a more detailed explanation of the technique. So here it is. As we've said repeatedly, you normally finish all your braking before you start turning into a corner. But if you're still using your brakes gently - always gently - even as you begin to lean the motorcycle into the corner, you're trail braking. It's a delicate exercise. You see, you have a bigger contact patch when you're upright and all that traction can be used to slow the bike for the corner. When you start leaning the motorcycle, two things happen. First of all, the contact patch becomes smaller. And second, you have to start giving away traction to the action of turning the motorcycle. The harder you lean, the more traction you give away. The more you give away, the less you have left to perform braking with. At moderate lean angles, you can be pretty firm with the brakes as long as you're smooth. When leaned fully over, you have to be very delicate, applying nothing more than a hint of front brakes to continue scrubbing speed. At a racetrack, trail braking can help you get past a competing rider. On the road, it's basically best left as a skill for emergencies - like not reading a corner right, or finding that the corner tightens up on you halfway through and you need to lose more speed. It's a useful skill, though, so here's how you learn and apply it. Find a deserted stretch of tarmac and start leaving on your front brakes, gently, as you start turning the bike. At moderate lean angles, on clean tarmac, you shouldn't have a problem. Focus on how the bike feels. When you're comfortable, up the lean angle and lower the brake force you are using. What you're looking to learn is how you trade-off between lean angle and brake force. If you feel the front end beginning to fold towards the inside of the turn, you need to back off the brakes or you'll lose the front. Best place to learn this, of course, is the racetrack. Join the next OVERDRIVE presents TWO track school to practice this and other skills under the watchful eyes of our instructors. The next session is scheduled July 9-10, 2016. Here's the link for more details. 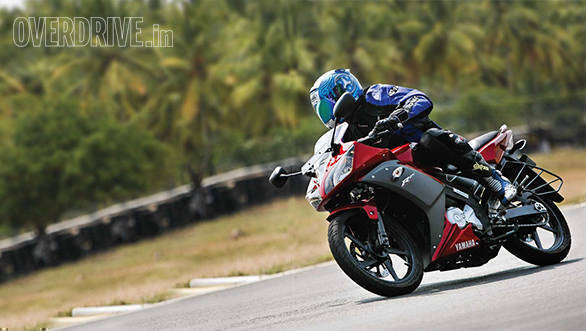 Also check out Rishabh's experience at the track school here. The more you connect to your bike, the easier it gets to balance lean angle and brake force. Trail braking is a skill for hazardous situations. Learn it on clean, deserted roads, and use only when needed. You already have very little traction. Apply and release inputs smoothly. Minimise suspension movement. Keeping the front brakes on only lightens up the rear wheel. Use carefully, if at all.